Linked together: The students have used electronic fabric to link people together. If you sit down on one stool the other one lights up – and there you have your conversation. Radient chairs and blinking carpets are part of the future, if we are to believe students of Oslo School of Architecture and Design (AHO) and Oslo National Academy of the Arts (KHiO). For the last to weeks students studying industrial design at Oslo School of Architecture and Design (AHO) and textile art at Oslo National Academy of the Arts (KHiO) have worked together on an electronic fabric project. Combining two very different fields of study they have created furniture, clothing and toys that is both flashy and warm. –⁠ The students have created something entirely new – and smart, Birgitta Cappelen, teacher at AHO, says. To think that the lobbies, children’s room and schools of the future are filled with blinking stools, murmuring teddy bears and magic hanging chairs is not that far-fetched after all. Electronic fabrics is also called «intelligent» fabric. Using electronic components and different fabrics the students have programmed everything from stools to teddy bears to do something «intelligent». 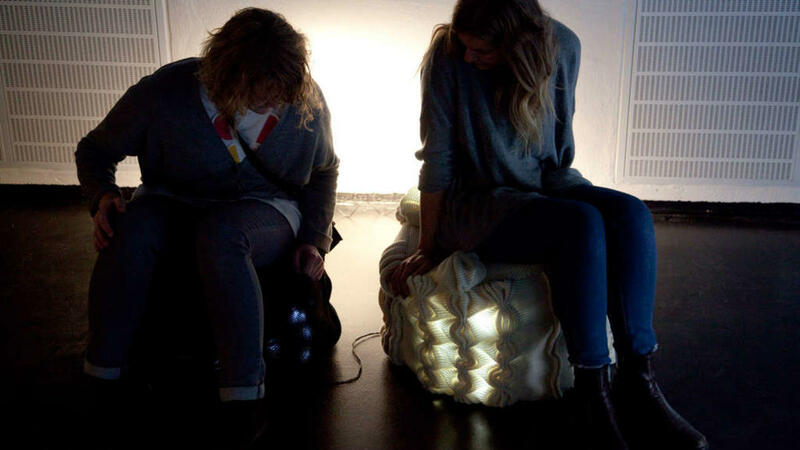 –⁠ We have knitted and weaved conductive thread and light bulbs into stools. This special kind of thread is very sensitive and sends signals to the light bulbs when somebody sits down, Ola Vogsholm from AHO says. His group has weaved light into two different stools and linked them together. When you sit down on one of them, the other one lights up. –⁠ That way you get linked to another person, textile student Helena Gyhagen says. The group views the stools as a comment to the secluded Norwegian attitude. –⁠ The idea is to provoke contact, which we seldom come across in the public sphere, textile student Ane Vik Eines says. Another group looked at solutions for the children’s room and made a curtain that tells stories. –⁠ We have made a curtain that are linked together with Rocky the teddy bear. When children plays with the teddy bear different parts of the curtain lights up, and the parents can tell stories based on what happens on the curtain, AHO student Nick Stevens says. –⁠ The interaction goes both ways. If you open this scary cave in the curtain, Rocky makes horrified sounds, textile student Ulrikke Pedersen adds. The meeting between students focused on design and students focused on esthetics has not been without difficulties, according to both students and Cappelen. –⁠ The students had entirely different perspectives coming into this project. Some professional and personal difficulties were hard to avoid, Cappelen says. The students themselves say that these challenges probably were the most valuable aspect of the whole project. –⁠ The biggest challenge has been to make the other students understand what you mean. In many ways we speak different languages. In my group focusing on communication has been very important, textile student Helena Gyhagen says. Teacher Birgitta Cappelen hopes that the two schools, each on their own side of Akerselva, can collaborate more in the future. –⁠ Itʼs just one brigde between us. We want this bridge to be used and worn down.